Earblock, known medically as Barotrauma, is a phenomenon experienced by a person when the airplane descends from a high altitude to lower altitudes. It usually occurs when the plane is landing to the airport. As it lands, the pressure inside the plane increases until the eardrums can’t bear the difference of pressure inside and outside the ears. People having earblock experience deafness and pain inside the ears, specifically at the eardrums. Earblock is usually felt in small pressurized airplanes. It may also be felt in large commercial planes, albeit milder than in smaller planes. Yes, yawning is not just being done when you are sleepy. It has other purposes and its main purpose is to equalize the pressure inside the ears with that of the environment. When you yawn, sometimes you may hear a popping sound inside your ears. That sound is caused by the air rushing to your ears from the Eustachian tube, otherwise known as the auditory tube. This tube connects the inner ear with the pharynx. If yawning can’t ease the earblock, the next thing you can do is to force air to your inner ear. To do this, you have to pinch your nose and blow hard through it. The air will have no place to go but to pass through the auditory tube and enter the inner ear. You may feel uneasy doing this but it is the best way of easing the pressure for your eardrums. As the plane lands, it is suggested that you chew bubble gum to prevent earblock. Chewing makes the muscle around the auditory tube to move so as to allow the opening of the tube. The air will easily enter the inner ear and normalize the pressure. Be careful when doing the above techniques to ease earblocks, especially the second suggestion. Do not blow too hard or you may break your eardrums. You will know that you blew enough air if your ears feel much better and your hearing returned to normal. It is also suggest that you refrain from chewing gum while the plane is ascending to higher altitudes. The reason for this is that the pressure in the inner ear will decrease, as the pressure inside the plane decreases. When this happens, it is more likely that you will experience earblock when the plane descends. See a doctor if pain and deafness persist after following the suggestions mentioned above. Visit Before the Eastern Sunset and read my take on latest victory of Manny Pacquiao. 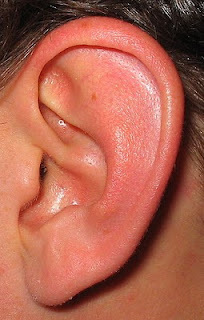 Picture of Ear taken from Wikimedia Commons.